There’s a sad truth to the amount of time people work in today’s world just to pay the bills, let alone get ahead in life. The saddest part is the amount of energy needed to put into a dead end job that isn’t enjoyable. Do you work hard for someone else? Do you work hard for yourself, but don’t have the time to enjoy life? Is entrepreneurship one of your goals? How about making enough passive income to enjoy life? If you’ve answered yes to either of the questions then you may want to read Never Work Again: Work Less, Earn More, & Live Your Freedom by Erlend Bakke. Bakke explains in detail how the average person can find their passion. What steps are needed to become an entrepreneur and how to make a passive income with jobs that can be enjoyable. Jobs that can free you of the mainstream workforce. What freedom means to each individual. Where to start with your business from beginning to end. Whether you’re just starting out, have your own business already, or need an extra nudge to reach the finish line. Bakke’s book reads like a business guide and covers several different business strategies. His first chapter: No Pain, No Gain? gives you the history of his trials and tribulations. Where he started, the mistakes he made, and the illness that followed. What would your first thoughts be if death landed at your door at an early age? No, Bakke didn’t die, but ending up in the hospital made him realize that he could die any day. With that thought in mind, Bakke focused on his business. A business that would make him money without taking up every minute of his time. In this chapter, he explains the four levels of entrepreneurship. Wantrepreneurs: people who want to start their own business. Solopreneurs: people who have started their own business, but are the only one working it- self-employed. Operators: Operators have a business that owns them. They work endless hours managing their employees and making sure everything goes smoothly. Business Owners: A business owner who owns a system, so he doesn’t have to work every day. Chapter three: Clarity-Finding Your Path. The title of this chapter speaks for itself. But what is your path? Is it to follow your heart and do what you’re most interested in? Say you want to build your own website focused on indigenous plants in your area? You know just about everything there is to know about native plants. Gardening brings you the zen you need in your life and you want to share this zen with the world. But you haven’t taken this step because you’ve been programmed at a young age to work in the mainstream workforce, hope for a good retirement plan, and cross your fingers you can retire at a decent age to enjoy life. This chapter delves into clarity and what it takes to deprogram societies expectations, find your balance, and achieve a higher level of happiness. Chapter four: Your Freedom Business. Want to know the steps in building your own business? Where to start? And what kind of businesses there are to choose from? You’re in the right place. Learn various ways to build your own business. No Money Down. In chapters 5 and 6 Bakke talks about managing time better, automating your business, and outsourcing. Can’t stand accounting? Hire someone else to do it! 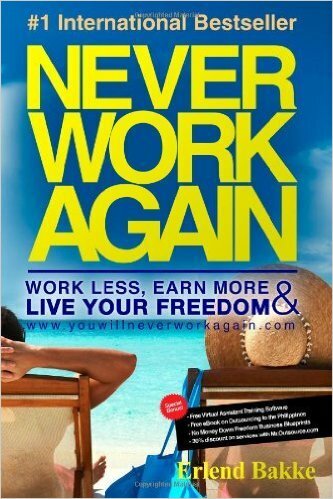 Never Work Again is not just another self-help book. This book goes into depth on creating your business and the steps needed to achieve your personal goals. The mindset of a worker-vs-a entrepreneur. How daily habits affect your business. Copying and expanding on what other successful people have done. Continuing to train in your business. How respect for your employees can get you further in your business. Free training videos, PDF files and exercises on how to manage your time better.